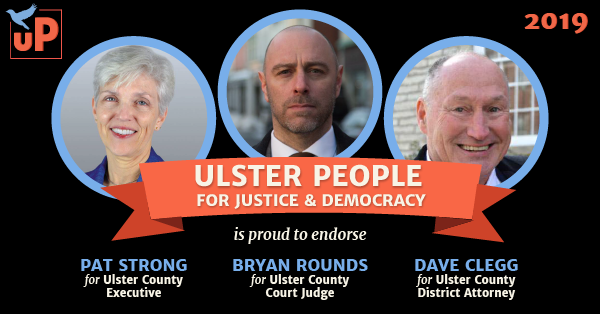 We are pleased to announce that Ulster People for Justice and Democracy is now accepting applications for our candidates seeking our 2019 endorsement in countywide races (D.A., County Executive, and County Judge). As a result of New York state’s newly consolidated primaries, we are working under an accelerated endorsement process. Therefore, we ask that candidates seeking county-wide office complete our 2018 State & Local Endorsement Questionnaire by Tuesday, February 12 by midnight, and submit a resumé and candidate bio. Please also contact Thomas Brown (tcbrown350@gmail.com), chair of the screening committee, ASAP to schedule an interview with our endorsement committee. The committee will make a recommendation based on platform support and viability as a candidate. Final endorsement decisions are determined by a vote of our voting membership. That vote is tentatively scheduled for the evening of Monday, February 18. For county legislature candidates interested in our endorsement: our 2019 candidate questionnaire will be released soon. Please keep an eye on this page, or sign up for our email list, for details. Juan Figueroa is uniquely qualified to bring real change to the Ulster County Sheriff’s department. His plans include diversifying the department, introducing training to combat racism, treating the opioid epidemic as a public health, rather than a criminal justice, issue, and refusing to cooperate with federal immigration agents targeting our undocumented neighbors. As a Marine Corps veteran with 22 years years of service and 25 years as a NY State Trooper and Investigator, he has extensive experience in law enforcement. As a person of color who has experienced discrimination, he understands the challenges– and importance– of fostering mutual trust and respect between law enforcement and the community. He believes immigrants must be able to contact the Sheriff’s Office without fear, and is fluent in both English and Spanish. Driven by a strong sense of justice and public service, he is committed to serving and protecting all residents of Ulster County and upholding due process and equal protection under the law. Jen Metzger is a town councilwoman, environmental activist and community advocate. She is deeply knowledgeable about social, environmental, and economic issues. As director of Citizens for Local Power, Jen negotiated the first ever reduction in Central Hudson’s service charge and led the effort to keep the Pilgrim Pipeline from carrying Bakken crude oil through our backyards, an effort that produced a domino effect up and down the Hudson River. As a municipal official, she has pursued a local, sustainable energy economy and improved quality of life for residents without raising the costs. She has done so by being simultaneously respectful, fierce, stubborn, smart, compassionate and effective. Pat Strong brings a progressive vision to economic, environmental, and creative possibilities for the Hudson Valley. She has been an advocate for fully and fairly funded public schools, common sense gun safety, effective interventions and treatment for those addicted to opiods and programs to disrupt the school to prison pipeline. She is an advocate for renewable and sustainable energy and environmental justice for communities suffering the effects of toxic pollution. Pat will be a strong voice against the antidemocratic forces at work in our body politic. Joyce St. George promises to be a real representative for a district that has felt largely ignored for too long. Her career in law enforcement in NYC, where she was the first female investigator to serve in the AG’s anti-corruption unit, included rooting out crime within the criminal justice system, working with the US Justice Department to mediate between police and communities of color and training others in crisis and conflict management. She has since worked as a court mediator for Delaware-Otsego Counties, assisted FEMA providing crisis services following Irene and other disastrous storms, spearheaded the movement to evict the Mercer-funded, Bannon-inspired Reclaim NY from Delaware County, and hosted a radio program, “Conflict Revolution,” that brings together people with different perspectives. She advocates for rural communities and family farms, for sustainable energy, economic equity and social justice. And as a Puerto Rican woman, she brings a much needed perspective and voice to Albany politics. We are pleased to announce that Ulster People for Justice and Democracy is now accepting applications for our 2018 CD-19 Endorsement. To help us decide which candidate to endorse for CD-19, we are asking all challengers who are interested in our endorsement to complete our endorsement form. Please see here for instructions. Our screening committee will contact applicants following receipt of the questionnaire to arrange a personal interview. The committee will make a recommendation based on platform support and viability as a candidate. 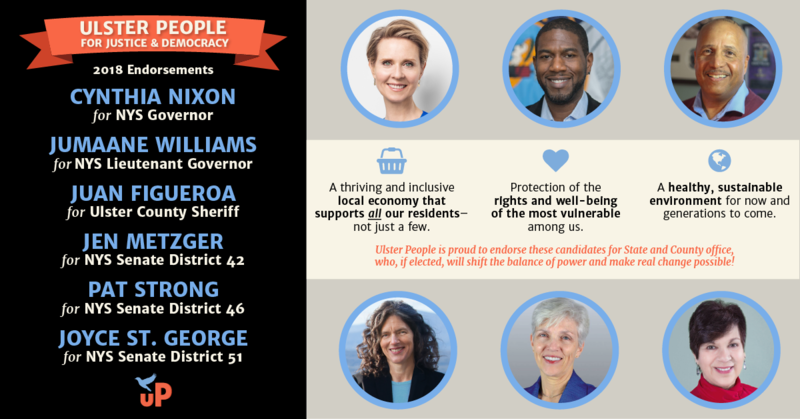 Final endorsement decisions are determined by a vote of our voting membership, and may be coordinated with other NYPAN chapters in the district. Although we have requested that the forms returned by February 15, we hope to accomplish our review of candidates as quickly as possible. Please contact Bill Barr, chair of the screening committee, at runforoffice@ulsterpeople.org with any questions. Ulster People for Justice & Democracy is platform-based political organization, unaffiliated with any party, that evolved out of the grassroots group Ulster County Volunteers for Bernie (aka Ulster4Bernie).